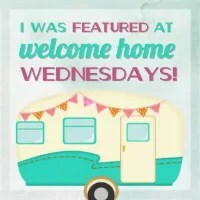 Welcome to Welcome Home Wednesdays #88!!! We had a busy Easter, but a nice one! I love that fact the kids still like to have our annual Easter egg hunt in the yard. We have a tradition of a very well hidden golden egg going to the lucky finder. This year although it was very well hidden in a tree, our daughter found it right away….it was crazy, but fun! Hope you enjoyed your holiday! Now let’s party! Each week our little party gets even bigger… and we’re so glad you’re here to party with us! So bring your friends and link up something awesome… we love to see your amazing work around here! Don’t forget to leave us a comment to let us know you stopped by and we’ll do the same when we visit your link! The party will start each Wednesday at 7am CST… and we’ll be here bright eyed, bushy tailed and ready to party! Stop by and share your fabulous posts… we would love to read them and share them with our friends! Like any good hosts we’re sitting right by the present table waiting until our guests leave so we can go through the loot… the loot being your Welcome Home Wednesdays #88 links! We can’t wait to check out what you’ve left for us. Trust me there will be a lot of pinning, tweeting and facebook sharing going on in the near future… we can’t wait to show off what you’ve left! Thanks Liz for the pick! I am flattered that you chose me. Thanks for partying with us, Jenny! We love having you here. Hope you’re having a productive week! Thank you Erin for co-hosting Welcome Home Wednesday no .88, always appreciated. Always a pleasure to have you with us, Joy! Have a wonderful week!